Squad and Wives: Doug Caren, Ian Downie, Keith & Ann Forster, Ron Fraser, Rab Keddie, Guy & Margaret Leighton, Jim & Jean Mitchinson, Doug Morrice, Alistair Philip, John Smith, Jim & Kath White. Umpires: Ken Hunter and Gerry Toner. Once more, Norrie and Dorothy Springford generously provided board and lodging in the Apex City Quay Hotel for the Club Dinner on 3 March and AGM the following morning. At the AGM on Sunday 4 March, President George Black and Secretary/Treasurer Keith Forster were re-elected and Alan Auld was nominated to replace Alistair Philip as Club Captain. Alan Strachan was re-elected as an Ordinary Committee Member and Alistair Philip accepted his nomination for the remaining place on the committee. After the AGM, there was an intra club match aimed at selection for the matches against England two weeks later. 26 players took part, with two teams selected mainly on the basis of age, with a number of players who were not available for the England matches filling spaces in the Over 65 squad. The keepers rotated: George Black, Ron Fraser, Guy Leighton. Gerry Toner umpired. England won both the Over 60 (6-0) and Over 65 (3-1) matches. It proved impossible to put together a genuine Over 65 side. The following is a guess at the composition of the two squads based on the photograph of the Over 60 participants and the hotel information. Over 60: Alan Auld, Alan Bryce, Roy Crichton, Ian Downie, Douglas Dunlop, Andy Ferrol, Guy Leighton, Dave McIntosh, Peter Monaghan ,Harry Phillips, Colin Skinner, Colin Tucker, Sandy Weir. Over 65: Howard Andrew, George Black, Doug Caren, David Cassell, Ernie di Rollo, Keith Forster, Ron Fraser, David Margerison, Jim Mitchinson, Alistair Philip, Alan Strachan, Jim White. Peter Terleski played as a guest. A good number of wives accompanied their husbands: Anne Black, Sue Cassell, Linda Dunlop, Ann Forster, Jean Mitchinson, Marjory Monaghan, Kath White. 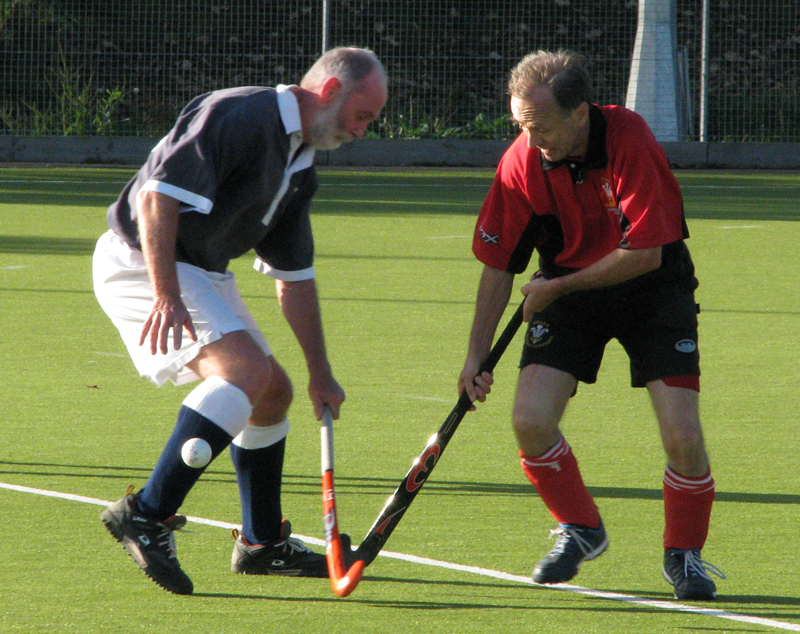 Scottish Thistles had hoped to play in Lille in May 2007 following the postponement of the annual LUC Ronchin tournament in March because the pitch was being re-laid. Unfortunately the work went more slowly than expected and the 2007 tournament was cancelled. Johan Herbert came to the rescue by organising a tournament at St George's HC and Scottish Thistles, with a couple of guests, won it! The teams competing were Alliance, Friends of Scotland and Scottish Thistles, who played each other twice over two days..
George Black, Alan Bremner, David Cassell, Keith Forster, Rab Keddie, David McIntosh, Jim Mitchinson, Peter Monaghan, Alistair Philip, John Smith. Guests Matthias Baekelandt and Gurney White. Wives Anne Black, Alison Bremner, Sue Cassell, Ann Forster, Jean Mitchinson, Marjory Monaghan. Practice matches between the two age groups ahead of the European Cup took place at Meggetland over two days, with 23 players taking part on the Saturday and 26 on the Sunday. As at the training session in March, gaps in the Over 65 squad were filled by younger players and, on the Sunday, by an Australian player! Over 65 Saturday: George Black, Alex Cathro, Roy Crichton, George Dunbar, Keith Forster, Ron Fraser, Mike McLintock, Peter Monaghan, Alistair Philip, John Smith, Colin Tucker, Jim White. Over 65 Sunday: Alex Cathro was not available and his place was taken by John Lees of Dunfermline Carnegie, with Bob Bowyer of Australia coming in to give George Dunbar a rest. Scotland travelled to the inaugural WGMA European Cup in Canterbury with only 25 players to service two teams. 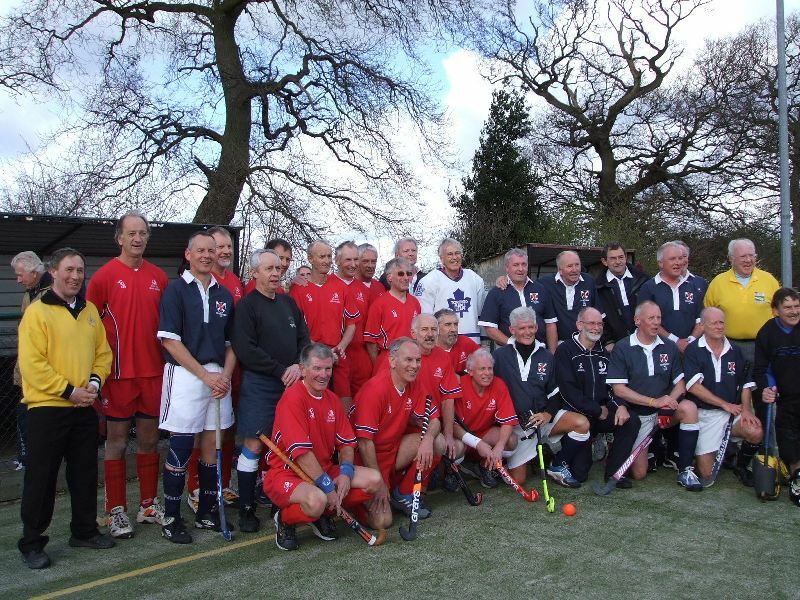 Both the Over 60 and Over 65 sides played in a round robin competion against England, Germany and Netherlands, the Over 60 side also playing Italy. Unfortunately, the original reports are lost but it is hoped that the players involved may be able to recollect events (particularly the goal scorers). Squad: Alan Bryce (Captain), Doug Caren, Ian Downie, Douglas Dunlop, Guy Leighton, Dave McIntosh, David Margerison, Jim Mitchinson, Harry Phillips, Colin Skinner, Alan Strachan, Sandy Weir. Mike McLintock was selected but had to withdraw through illness. Squad: Howard Andrew, George Black (Captain). Alan Bremner, David Cassell, Ernie di Rollo, Keith Forster, Rab Keddie, Kieran McLernan, Peter Monaghan, Doug Morrice, Alistair Philip, Jim White. Evan Llloyd was selected but had to withdraw through illness. The score in the intra-club match was Blues 5, Whites 7. The Over 60 side lost 2-1 to Cheesy's Buddies and the score in the Over 65 match is lost in the mists of time. Some players had to double up on the Sunday. Sunday Squad: Matt Aird, George Black, Alan Bremner, Brian Caulfield, Ernie di Rollo, Ian Downie, George Dunbar, Keith Forster, Ron Fraser, Rab Keddie, Dave McIntosh, David Margerison, Jim Mitchinson, Peter Monaghan, John Smith, Norrie Springford, Alan Strachan, Peter Terleski plus Charlie Lambert. Umpire:s Ken Hunter and Gerry Toner. Wives present at the get together on the Saturday night were Anne Black, Alison Bremner, Hazel Crichton, Linda Dunlop, Margo Keddie, Mary McIntosh, Jean Mitchinson, Marjory Monaghan, Kath Strachan and Jess Tner. Scottish Thistles won a very large cup (for second place?) in a very friendly tournament held in Italy. That's about all your webmaster remembers, other than the fact that there was an air traffic controller's strike and that suitcases did not all make it to Padua. Oh, yes, and we lost to Egypt on the Sunday morning after a very convivial night which lasted till around 4 a.m. Squad: Matt Aird, Brian Caulfield, Howard Andrew, George Black, Alan Bremner, Ernie di Rollo, Keith Forster, Rab Keddie, Dave McIntosh, Keiran McLernan Jim Mitchinson, Doug Morrice, Murdoch Shirreffs, John Smith, Sandy Weir, Jim White. Once again there was a good turn out of wives: Anne Black, Alison Bremner, Catherine Downie, Ann Forster, Margo Keddie, Mary McIntosh, Joan McLernan, Jean Mitchinson, Jenny Shirreffs, Jean Weir, Kath White. Scotland invited Wales to play their first ever international Grand Masters matches in Aberdeen. The Welsh gave a good account of themselves but Scotland came out on top with a 2-1 win in the first match and a 1-1 draw the following day. Squad: Howard Andrew, Alan Auld, George Black, Alan Bremner (Sat), Alan Bryce, Doug Caren, Roy Crichton, Ian Downie,Tony Duguid, Keith Forster, Rab Keddie, Guy Leighton, Dave McIntosh, Keiran McLernan, Doug Morrice, Colin Tucker (Sun), Sandy Weir.